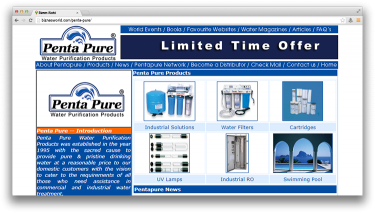 Description Pentapure is a prominent and trusted name in the field of water purification and filtration industry. It caters the entire needs of all sectors including domestic, commercial and industrial, with its mammoth range of water filtration equipments. From variety of sediment and carbon block cartridges to filter housings in various colors and sizes and from water purifiers featuring UV Sterilizers to Reverse Osmosis Systems (RO units), Pentapure offers a complete satisfaction to its huge clientele for their problems related to drinking water. Address Plot No.591-92, Korangi Road, Sindh, Karachi.